act as the council’s lead Caldicott Guardian; ensuring that the principles are incorporated into the council’s policies, procedures and practice. View the job description (PDF, 161.9 KB). Penny was appointed Corporate Director, Adult Social Care and Health in March 2018. Previously she was Director of Disabled Children’s, Adult Learning Disabilities, and Mental Health to which she was appointed in 2011. 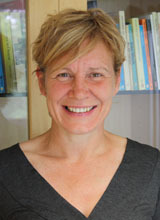 Penny began her career in Derbyshire working in day services for people with a learning disability before completing her social work training in Nottingham in 1985. She moved to Kent in 1987 and has since gained a wealth of experience in leading change, robust financial management and a sound track record of working successfully with partners to deliver integrated services. Over the last 8 years, along with her team, she has transformed services to meet the changing landscape of commissioned services and the increased demands on local services for health and social care. As KCC lead for adult social care transition, she led and delivered the county’s Lifespan Pathway which transformed the way the local teams now deliver services to young people. She was also part of an integrated team from health, public health and social care, driving the change for the future of mental health community services. After 2 years of working in partnership with the local CCGs, Penny was instrumental in the signing of the first health and social care alliance agreement, securing the future of the integration of services for adults with a learning disability. She has been a key driver in establishing the Principle Social Worker (PSW) Quality network and established the right platform for the recruitment of a PSW post in Adult Social Care in Kent, assuring professional development and quality practice in all of the registered and non-registered staff who play a crucial role in the delivery of local community based services. Penny's expenses for the past financial year are £2,296.89. Trustee of Folkestone and Hythe District Mencap.